Find how much polymeric sand you need for your paver patio, walkway, or driveway project by entering the size of the installation below. Polymeric Sand – What Is It? Polymeric sand, or jointing sand, is a fine sand bound with polymers that is used to fill joints between pavers. It’s often swept into the joints and then sprayed with water to activate the polymers. After hardening, it is resistance to washing out, prevents ant hills and weed growth, and locks the paver installation preventing pavers from coming loose and making the patio or driveway more durable. Polymeric sand coverage will vary slightly from product to product, and is largely determined by the thickness of the gap between the pavers. Patios with a large gap or when using a stone with a tumbled edge will require more polymeric sand to fill the gaps than a patio with a tight gap or pavers with a honed edged. When filling small gaps, a 50lb bag of polymeric sand will usually cover 75-100 ft2. When filling wide gaps of 1/4″ to 3/8″ a 50lb bag will usually cover 30-60 ft2. Wider gaps, for example with a flagstone patio, will require even more sand to fill. A flagstone patio with large or irregular gaps may need a 50lb bag for every 8-10 ft2. It is important to verify the coverage for the material you’re using, the amount of coverage is often labelled on the package. 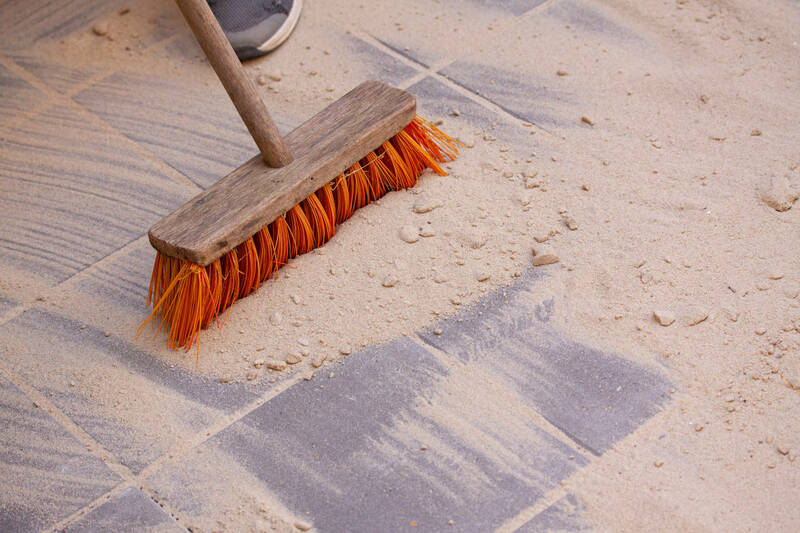 After identifying the polymeric sand coverage for your patio, simply divide the square footage of the area by the coverage of the sand to find how many bags are needed. See our paver calculator to find how many pavers are needed for your patio.